Was Melania Trump’s speech plagiarism? Definitely. And comments like those from Chris Christie trying to defend the speech saying that it was OK because it was 93% her own work – only illustrate how poorly plagiarism is understood by many people. This is what is often called a teachable moment. Plagiarism is passing off the words and ideas of others as your own, which is what happened last night in Melania Trump’s speech at the RNC in Cleveland. It is pretty clear that she (or her speechwriter) copied parts of Michelle Obama’s 2008 DNC speech. You can see the relevant parts of the speeches side by side below. Now some of the ideas here are fairly cliché—you need to work hard for what you want, your word is your bond, or children are the future, for example. The Trump campaign has defended Melania by suggesting she is just using common phrases (http://www.snappytv.com/tc/2399917). 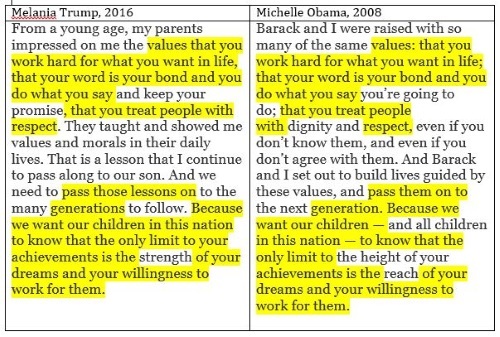 However, there are two clear signs that this is plagiarized: the fact that these ideas are expressed in exactly the same order and the fact that they were taken from a speech in exactly the same context (potential first lady discussing her values). In many places, these ideas are also expressed in the same words. And any amount of plagiarism counts as plagiarism—the fact that 93% of the ideas were original doesn’t matter. Clearly, someone used Michelle Obama’s speech as a model and borrowed too closely from it. If this were one of my students, this assignment would be a 0 until they had correctly attributed all of their sources or removed the sentences completely. It is tempting to focus on the faults of the individual who plagiarizes, citing dishonesty or laziness, but most scholarship on plagiarism in the last twenty years has revealed that it is more effective to address the structural and situational factors that lead to plagiarism, and those are clearly present in this case. Insecurity—People often plagiarize because they are nervous or insecure about their ability to write (http://www.wpacouncil.org/archives/16n3/16n3wells.pdf). They don’t feel that their ideas are good enough, so they borrow ideas and words from another person. NBC News reported that Melania was nervous about speaking Monday night, so this could be a contributing factor (http://www.nbcnews.com/politics/2016-election/donald-trump-introduce-wife-melania-s-speech-rnc-n612061) . Poor time management–Running up against a deadline is another reason plagiarizers often give for their actions. They run out of time to produce original work (writing is hard! ), so they take a shortcut. Leading up to the RNC in Cleveland, there were many accounts that described a disorganized campaign in a rush to get speakers and events ready (http://abc7.com/politics/trump-takes-center-stage-at-republican-national-convention/1431029/). Generic assignments—Sometimes paper assignments are so generic that students find it easy to find generic answers. A generic assignment invites a canned response. Many critical reactions to Melania’s speech noted that she did not offer specific anecdotes or examples from her own life (http://www.slate.com/blogs/the_slatest/2016/07/18/melania_trump_s_pathetic_rnc_speech.html) . If she had trusted her own voice and experiences more, this would have left her speech less reliant on platitudes borrowed from another. Blurring boundaries in an online world—before the Internet, who owned which ideas used to be a little clearer, but now people are used to content (songs, images, words, etc.) freely flowing everywhere, which makes attribution more difficult and the concept of plagiarism harder to understand. The Internet has hundreds of models of papers and speeches at the click of a button—it’s very easy to find good examples and very hard to attribute them correctly. However, if the Internet has made plagiarism easier, it has also made discovering plagiarism easier. I tell my students—if you can google it, so can I. This has clearly happened, as many scholars and journalists easily noticed the plagiarism in Melania’s speech. If Melania Trump had attributed her words to Michelle Obama, that would remove the plagiarism, but considering the context of her speech, that would hardly serve her purpose, so she (or her speechwriter) should have allowed more time to write the speech and trusted Melania’s specific voice and experiences to represent her feelings and values. Plagiarizers often rely on the words of others because they are embarrassed about their own ability to communicate, but that is nothing compared to the public embarrassment of being caught. This is an incredibly painful lesson to learn, as I am sure Melania Trump and the Trump campaign have discovered. Laura Struve is a Professor of English and Chair of the Humanities at Wilmington College. She received her Ph.D. in English Literature from Princeton University in 2000. Her scholarship focuses on Victorian literature, gender, and popular culture. Dorothy Wells explains in WPA: Writing Program Administration that “much of the plagiarism in term papers . . . resulted from desperation. Desperate measures are required in desperate situations, and writers who are uncertain of their abilities, of the appropriateness of their authorial voices, of the meanings of the materials they read, or of the teacher’s expectations for the assignment prefer ‘getting something in’ to getting nothing in.” Dorothy Wells, “An Account of the Complex Causes of Unintentional Plagiarism in College Writing.“ WPA: Writing Program Administration 16.3 (1993): 59-71. Web.